The human brain resists change, which in evolutionary terms, is a good thing. Resisting change is a reasonable survival tactic for individuals: repeating tasks we’re familiar with takes less brain energy and has known outcomes, while making changes to one's routine creates a higher short-term risk of mistakes. But for a business, resistance to change can easily mean extinction. As an anthropologist who helps businesses change, I work with executives every day who find themselves needing to take a fresh look at their company’s culture and products. This is always a journey, fraught with resistance and fear on an exponential scale, and the truth is right there in the daily financial news—not every company makes it. I make it my business to help companies discover opportunities for business growth and get past the resistance and fear that inevitably stands in the way of change. One of the biggest determinants of success? Company culture. Who must lead this success? The ones at the top, a company's leaders. Crisis Motivation: I’m talking about a crisis, real or perceived, that cries out for a company to deal with. Something in the culture is “stuck”: market growth has stalled, products are suddenly not selling, key personnel are defecting. Whatever the problem, the important thing is that people inside the company, especially the executives, recognize that the pressure is building and are motivated to do something. Ironically, crisis offers the perfect chance to change. I had one client who essentially said: "I need to create a crisis or nothing will change, and everything around us is changing, fast." Exactly. New Leadership: When a company welcomes a new leader, often there is an inherent mandate to rethink the business. A new CEO or general manager is in a perfect position to step back and take a fresh look at the “way we do things here.” That's why transformation often hinges on new leadership—whether it is a new person in the front office or a change in style from the ones at the top, the important thing here is a motivation at the highest levels to not just accept change, but to drive it. Once installed, however, the challenge for the new leader is the power of the "herd." People (not only in business but everywhere) live in herds—deeply ingrained cultures embodying the right values, shared beliefs and embedded behaviors that help us get along with each other. 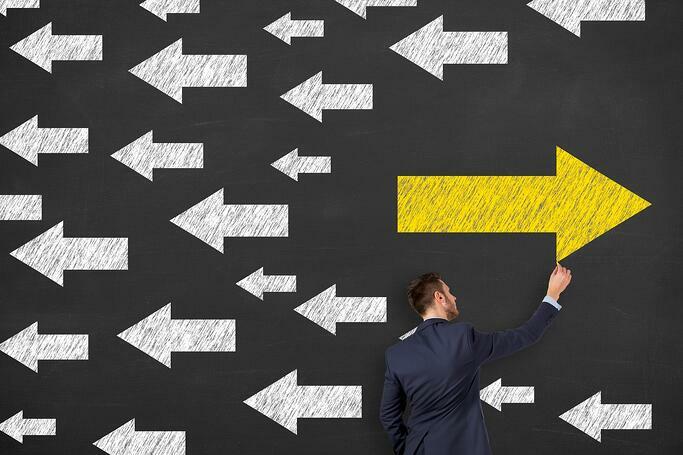 New leaders and new staff find themselves struggling to push the old order forward rather than have the it pull them backward, negating the very reasons they were brought into the organization. Openness: A significant level of openness needs to extend to everyone in the company and in most cases, that means employees and management will need a new tool kit for making it happen. One of the most successful scenarios I've observed is one in which employees are deeply involved and can see the need for change themselves. I call this “active learning,” which studies show is one of the best ways to learn. Remember, our brains hate the new and change is painful. So you have to push forward and make "the new" actually "the preferred." Fresh Blood: Demographics matter. One of the consistent things I see is that new, young hires behave differently than the older folks who were in their jobs previously. The same can be true for younger staff expecting new things from a seasoned workforce. Add to this the changing needs of a younger generation of customers. Make no mistake: Fostering robust communication and an ongoing dialogue between generations, both internally and externally with clients and customers, is critical. Case in point: By 2020 (just four years away), 50% of the labor force are going to be those 30-somethings who have been challenging the old business models and culture. Yet I still have clients where Baby Boomer founders are struggling with the business styles of the Millennials who are coming to work for them. One president of a logistics firm even admitted how angry he was at having to buy a ping pong table for his new employees who told him they didn't take smoke breaks to relax, they play games. Whether he likes it or not, out with the old, in with the new! Flexible Strategy: Successful companies are open to changing the way they see things. To them, a problem is not an isolated incident that needs a one-time fix—it’s a chance to step back and see the bigger picture and adjust the overall strategy. I have executives telling me that where they used to plan five year strategies, now they’re planning two-year ones. Another development I am witnessing from my corporate work is that the abundance of data is a challenge for older strategies. The need to visualize the data and create motivating stories from it is now proving to be the biggest obstacle to harnessing and using that data in strategic ways. At Simon Associates Management Consultants, we are teaching an online course for SHSMD on this topic because we're seeing healthcare strategists continue to struggle with the meaning of their data and how to use it to shift directions or change behaviors. 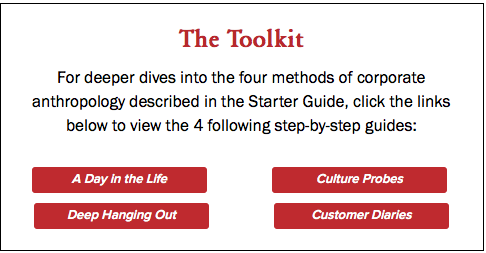 If you have a situation that could use a fresh lens, I suggest taking a look at the Corporate Anthropology Tool Kit I’ve put together. Just click on the box below.